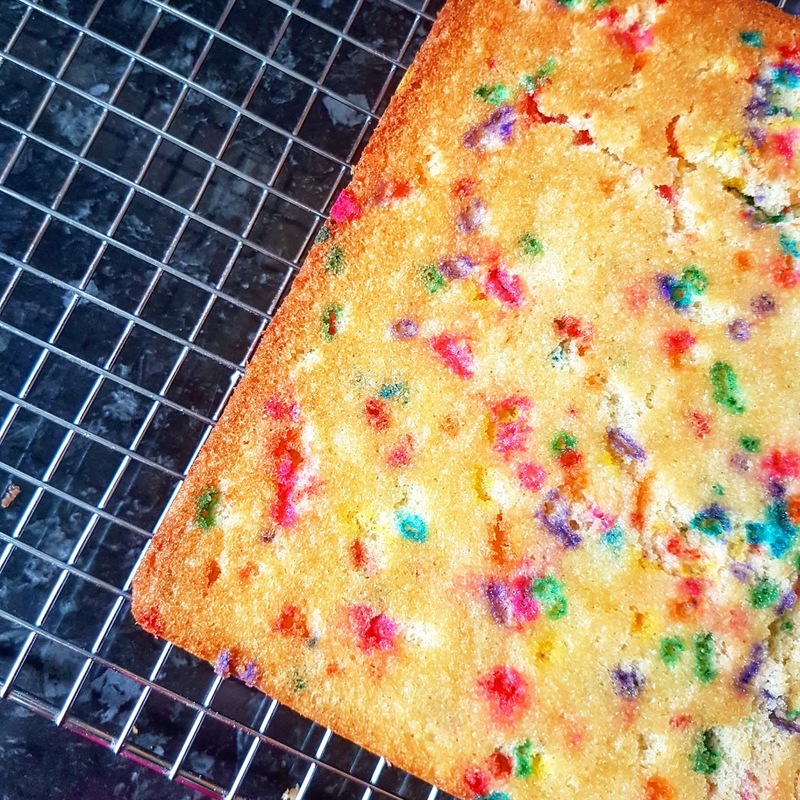 Remember when this blog used to be about baking… all the baking? 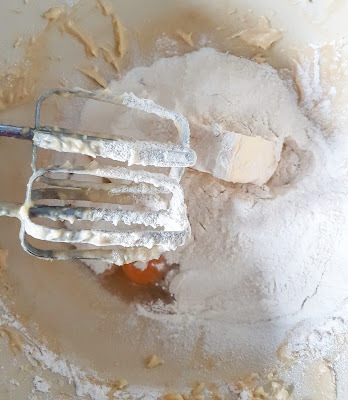 As most of you know, I rebranded earlier this year, to focus more on travel, lifestyle and dining out, but when I can, I still try to do the odd recipe post. In Florida I did a trip to Walmart to buy up all the rainbow sprinkles because the ones in the UK are so much less jazzy. 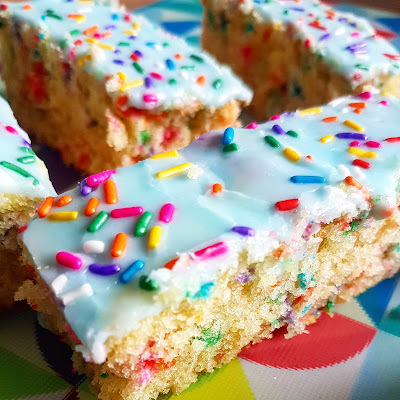 The American version may well have some seriously strong colouring but, for creating amazing cakes, they are so much better. The colour doesn’t bleed during baking either. I wish I'd bought more, so if anyone is headed to Walmart... can you sort me out? 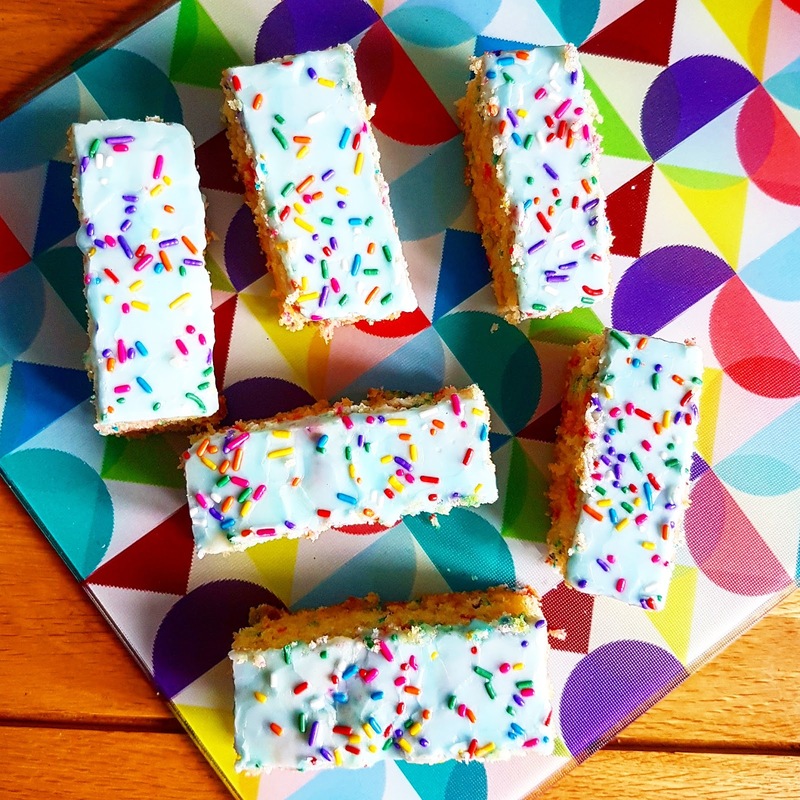 So today’s weekend bake is super simple, but looks great and can be made into cake bars great for parties or office Friday treats. And as a Glasgow food blogger, I'm always trying to put new food content on my blog! There’s so much nostalgia around these bars… does anyone remember having them in school (usually square shaped) and the highlight of school lunches? These are a bit more modern – snack bar format, rather than full on pudding but still a big nod to my youth! Happy Baking guys and if you give this a go, let me know! 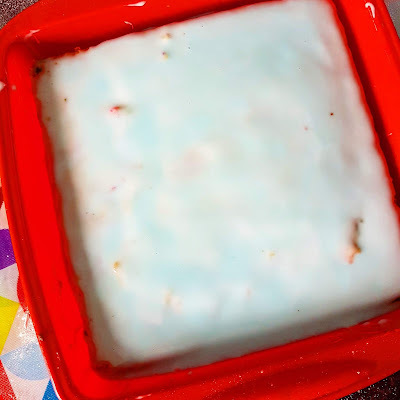 Grease a silicone 8in x 8in baking pan. Sieve both flours, add caster sugar, eggs and chopped butter to a large mixing bowl. Whisk with an electric mixer to mix to a cake batter. Add a little milk to loosen the batter and mix some more. This is the all in one method… total time saver! Add a tablespoon of rainbow sprinkles to the batter and gently fold in, don’t overmix. 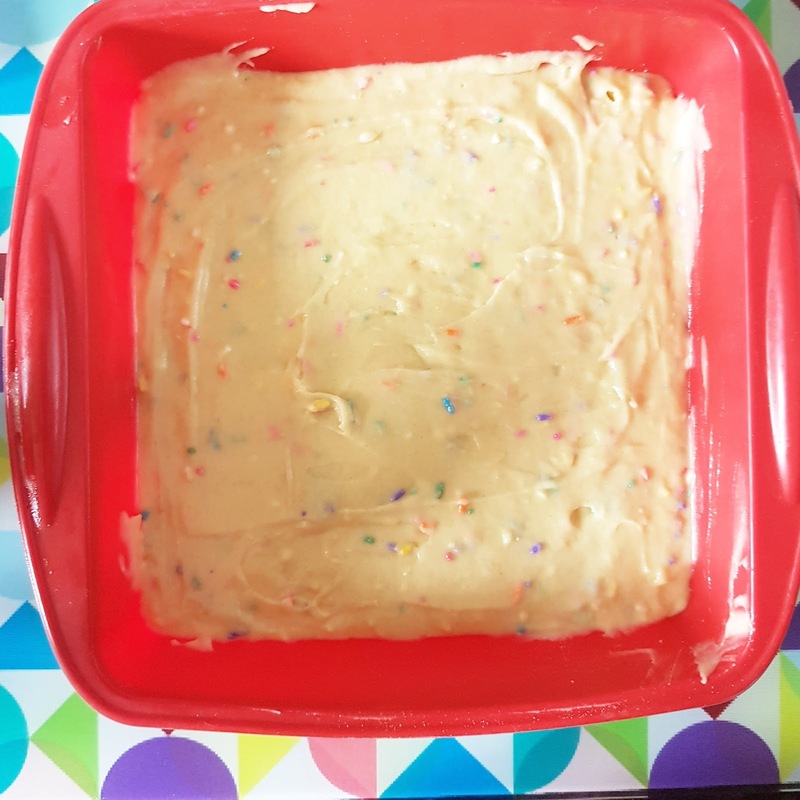 Add the cake batter to the pan, spread evenly and bake for around 20 minutes, or until a skewer inserted into the mix comes out clean. Add around 200g icing sugar to a bowl and slowly add in warm water, until a thick paste has formed. Add a few drops of gel icing to the mix and combine. Spread the icing paste over the top of the cake and allow to set for a few moments. 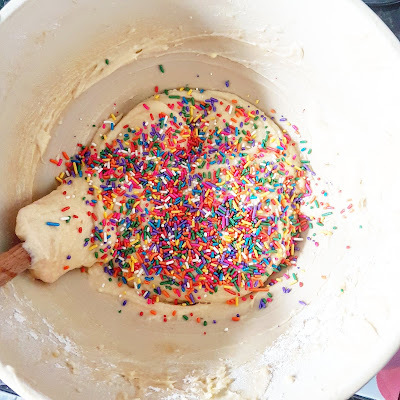 Then, sprinkle more rainbow sprinkles over the top and allow to set before slicing. Top tip – for clean looking bars, take a sharp knife and slice off each edge, for a neater finish, before slicing into 10 rectangular bars.